Garlic. Beloved fashion accessory of the French, scourge of the Vampire and source of painful ambivalence for the French Vampire. For the rest of us, this ugly onion is only welcome if it can be hidden in the taste and aroma of another dish, since eating anything with a trace of garlic is surely a case of social suicide. But it needn’t be so. Garlic has a long history of medical and culinary usage, despite the smell. So why does it smell so bad? – The scientific name of the main compound behind Garlic breath is Allyl Methyl Sulfide. 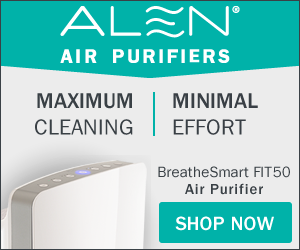 – AMS and other sulphur-heavy compounds are absorbed directly into the bloodstream during digestion. It is also not possible to fully break AMS down in the stomach, so it mostly rises as a gas and re-enters the respiratory system. – This means that whilst concentrated in the mouth (where bacteria there react with AMS), the smell can travel through your entire body! 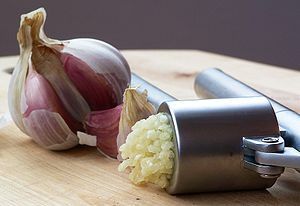 – Raw garlic is more pungent than cooked garlic, and when crushed (either in the mouth or with a garlic press) further compounds can be created, with an even stronger odour resulting. Considering all that, you may be wondering why you should even bother eating this ticket to halitosis-ville (or allow anyone around you to fall under its baleful influence). So why eat Garlic? – Obviously, because it can taste great and can add far subtler, sublime notes to your homemade sauces. – Compounds in Garlic have been proven to support the breakdown of Cholesterol, linking Garlic with prevention of heart disease and other diseases of the circulatory system. – Studies have also suggested it may ward of certain cancers. If garlic breath or its more serious side-effects are genuinely causing you grief, the simplest and only sure-fire way of banishing its baleful influence is to… well, stop eating it. But since you’re reading an article about how to eat garlic in some way or other, I’m betting you want a more satisfactory answer than that. Besides, if the health benefits attributed to raw garlic are to be believed, you’ll want to be working it into your diet somehow. Well, on this count there’s an easy way out: there are plenty of odourless garlic supplements out there. But for the vast majority of would be garlic eaters, these benefits are surely secondary. – Because of the way that Garlic interacts with our wider bodily systems, one of the least effective things you can do is clean your mouth by using mouthwash, brushing your teeth, sucking a mint or chewing gum. Not to say that doing these things will not reduce the effect in some way. Just don’t expect doing so to cure the problem on its own. – There are still plenty of ways of ingesting garlic that can minimise the odour from those sulphuric compounds. Certain drinks and foodstuffs are known to work wonders when ingested simultaneously to garlic. – Sipping from a glass of milk or even red wine is a widely known option. – Eating one and a half tablespoons of parsley or fennel can also nullify the smell. Parsley is often found in many recipes containing garlic for this reason. – Cooking garlic can neutralise the smell, but also burns away some of the goodness. And those are all the facts, so get out there are scandalise a few vampires with your appreciation of this spectacularly smelly vegetable. Steph Wood is a copywriter currently working on projects for Just Eat, who’ll find you the best Ealing takeaway and Croydon delivery deals on garlic laced foods! My nan always said to eat parsley. Deep fried garlic is fantastic as it keeps its flavour without the pungency. FYI if you want a baby’s breath to smell of garlic, rub a clove between its toes. The smell is so strong that it’s taken up into the blood and then released through the breath. FACT. Firstly, the opening sentence is comic genius. I didn’t actually know of all the benefits of eating garlic, I know that athletes use garlic tablets as an anti-oxident but thought it was more plecebo effect! I had a rather hefty amount of garic last night, as the social effects don’t bother me as much as the article suggests it does others! But might try and use some of the techniques in some of my dishes!